Picking blackberries is not for the delicate. The bushes are thick with nasty thorns, far worse than raspberries, and the thorns seem to proliferate on the branches heaviest with berries. Boots, jeans, long sleeves, and a hat are absolutely necessary if you want access to the biggest, juiciest berries, which are always deep within. Even so, there’s no way you will emerge unscathed. You never see the berries right away. It happens every time I head into a new spot: at first you’re tempted to move on, thinking that these bushes aren’t very fruitful, but you don’t. You wait. They’re there, and you know it, but your eyes aren’t ready yet. 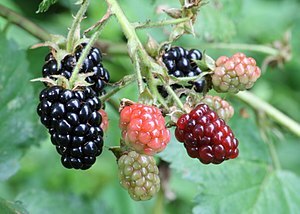 Then, all of sudden, boom, you catch sight of a branch laden with the shiny, dark purple berries. When that branch is picked clean you turn around and boom, there’s another one. It’s like those 3–D pictures that initially appear as a mass of squiggles until your eyes suddenly refocus and an intricate scene pops from the page. In dense patches where bushwhacking into the inner sanctums is next to impossible, I look for flattened swaths where bears have already been. They must sweep through at night, swiping pawsful as they pass. But they miss plenty, leaving ridiculously easy access to berries you wouldn’t otherwise be able to reach. The hardest part about berrying? Stopping. I always bring more containers than I think I’ll need, and if the picking is good, I can’t resist filling them all. When that’s done, I start filling my stomach. There’s always another fat berry just around the next bush. When I do finally leave, my pack filled with the spoils of my war with thorns, I feel victorious. Blueberry picking seems like such wimpy stuff in comparison. The real joy, though, is in the eating. By an accident of pure serendipity, we ran out of vanilla ice cream one evening, early in our vacation; all that was left in the freezer was a container of coffee ice cream. No all-night delis up there in the north woods to solve a minor problem like this, so we roughed it and went with the combo. One bite of the slightly bitter coffee ice cream with those winy, wild blackberries turned into one of those “Duh!” moments. Why hadn’t we tried this before? Vanilla is now ancient history. Whether freshly picked from bushes, or plucked from supermarket shelves, it’s time to take full advantage of ripe blackberries by transforming them into flaky turnovers. With my classic recipe, it takes less than an hour to go from a quart of fresh berries to a tray of hot pastries oozing with the inky dark fruit. While your 17-ounce package of frozen puff pastry is thawing, toss a quart of berries into a pot with 2/3 cup sugar, 1/4 teaspoon cinnamon, and a pinch of salt. Cook the mixture over medium heat, stirring and mashing the berries with a potato masher, until they release their juice; then simmer them for 5 minutes. Thicken it by stirring a slurry of 2 tablespoons cornstarch dissolved in 2 tablespoons water into the bubbling berries. Briskly simmer, stirring, for another 2 minutes to set the cornstarch. Scrape the filling into a bowl and chill it down quickly in the freezer. Roll out one sheet of puff pastry on a floured surface to a 12-inch square and quarter it. Spoon 3 tablespoons of the blackberry filling diagonally across the center of each quarter, then brush the edges with an egg wash (1 egg whisked with 1 tablespoon water). Fold quarters in half to form triangles, then press and seal the edges together with the tines of a fork. Arrange them on a rimmed baking sheet lined with parchment paper. Repeat with the remaining puff pastry sheet and filling. Brush the pockets with more eggwash, cut a couple of steam-release slits in each pocket, and bake them in a 400° F oven until golden, about 20 minutes. Cool them slightly to await your reward. First come the Mmmm’s, then come the purple-toothed grins! This entry was posted in Creative Nonfiction, Food Issue 2013 and tagged American chefs and food writers, Blackberry recipes, Diana Kennedy, Epicurious, Gourmet, Kemp Minifie, Madhur Jaffrey, Noted chefs, Parmigiano-Reggiano by Sandi Sonnenfeld. Bookmark the permalink. Thank you Kempy. I can just picture you doing some great picking in NH!! Sublime. You always know the most delicious haunts, Kempy! Mouth-watering article and recipe! Thanks, Kempy.